The Bicheno penguin tour was a must-do activity for my friend Samer. So when we got to Bicheno on the east coast of Tasmania, that was the first thing we organised. We rocked up to the Penguin Tour shop in town and booked ourselves on the tour taking place that very day. At night we returned, well in time to join the rest of the enthusiasts. We boarded a van and set off. We arrived in about 5-10 minutes. It was very dark and I wondered what, if anything, we would be able to see. We met our guide who led us along a boardwalk. 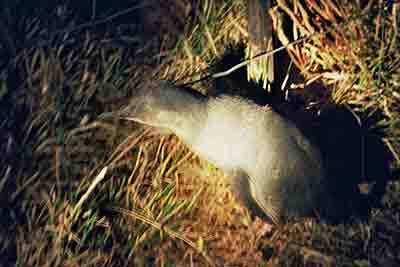 The guide told us that we had just arrived at a penguin rookery or colony. What kind of penguins were these? Little penguins, or fairy penguins, she told us. Apparently at dusk, these penguins return home from feeding in the ocean. We were about to see them making their way home to their respective burrows. Many many little penguins waddling home. They were not far away in the distance. Oh no. To my utter amazement, they were right up close to us. In fact the guide asked us to take special care while we walked. She even asked us to look behind us before stepping back. Samer was in seventh heaven. Non-flash photography was allowed and Samer managed to get a few photos like this one. It felt so wonderful to be able to walk among the penguins and see them up close. At the same time I wondered if we were stressing them out in any way by walking so close to them like this. The guide assured us that the penguins were very used to being around humans and the lights. We learnt that years ago it was human intervention that actually helped save these penguins. Numbers were low due to attacks by feral cats and other predators. After these animals were culled, penguin numbers recovered and are now in the hundreds. Hopefully fairy penguins everywhere will continue to have good reason to trust us humans!